Extracorporeal Membrane Oxygenation, also known as ECMO, is best described as long term life support occurring outside the patient’s body. It should be noted, however, that ECMO is temporary and typically lasts three to ten days on average. ECMO is a means of oxygenating blood without it having to circulate inside the body, and thus allows time for essential recovery of the heart and lungs. ECMO comes with many serious risks and is only used in severe cases of cardiac or respiratory failure when all other medical resources have been exhausted; however, ECMO will only be initiated if the patient does in fact have a chance at recovery. ECMO has been used as the preferred method of life support in certain cases only in the last half a century. In 1970 reports were made of the successful use of extracorporeal membrane oxygenation as life support in infants with congenital heart defects. Just five years later, reports were also made of the first successful use of ECMO in infants with severe respiratory distress. The structure of ECMO is very complex and includes a blood pump with raceway tubing, a venous reservoir, an oxygenator, and a heat exchanger. The ECMO circuit is essentially an artificial cardiopulmonary system for the patient. Deoxygenated blood will drain by gravity through a catheter, which is placed in a large vein in the patient’s neck. 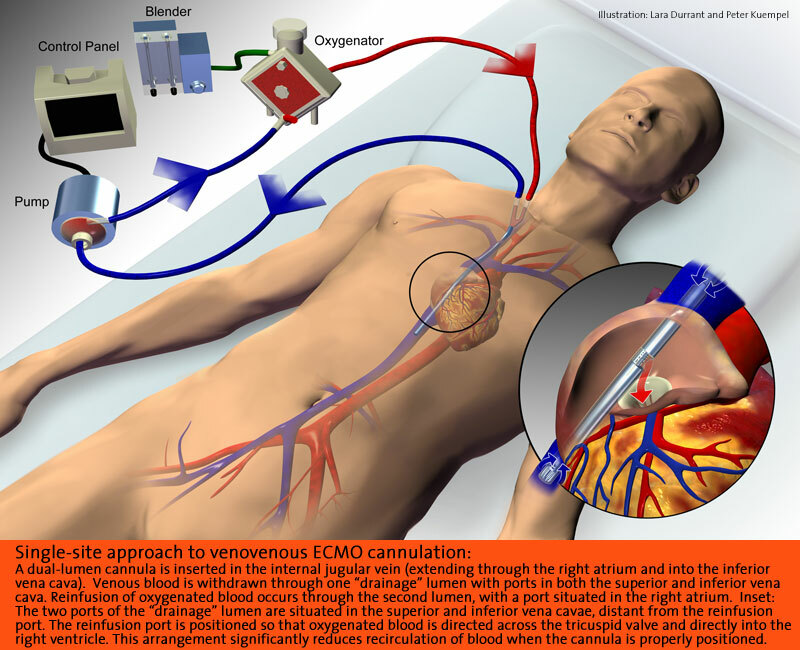 The catheter runs the blood to the pump, which pushes the blood through the ECMO circuit. The membrane oxygenator acts as the artificial lung, as it rids the blood of carbon dioxide and gives it oxygen. The blood is then rewarmed and pushed back to the patient through the catheter in the carotid artery. Blood is pumped in and out of the ECMO circuit concurrently so the body is not aware that the blood ever leaves. The blood pump, which acts as the artificial heart, is responsible for moving the blood throughout the ECMO circuit. It comes as either a simple roller pump or a constrained vortex centrifugal pump. The oxygenator, which acts as the artificial lung, is responsible for the blood gas exchange and is vital to the success of ECMO. The oxygenator can come as a bubble, membrane, or hollow-fiber type. The heat exchanger warms the blood using countercurrent force, as warm water circulates in metal tubing around the blood. There are many other machines attached to the ECMO circuit that contribute to its functioning. Air bubble detectors attach to the blood pump and can spontaneously turn it off if it detects even microscopic air bubbles in the arterialized blood. To prevent these bubbles from occuring, arterial line filters are placed between the heat exchanger and the arterial cannula to trap air and other clots. The oxygenator is followed and preceded by pressure monitors that measure the pressure of the circulating blood. This is especially helpful in detecting a thrombosis or a distal occlusion. There are also temperature and oxygen saturation monitors placed along the ECMO circuit that ensure safety. There are two ECMO procedures used for patients: venoarterial and venovenous. VA ECMO is the most common and is described as having the venous cannula placed through the right jugular vein into the right atrium and the arterial cannula in the right carotid artery through to the aortic arch. VV ECMO works slightly differently in that it has a double-lumen cannula placed through the right jugular vein into the right atrium, so deoxygenated blood leaves through the outer catheter wall and oxygenated blood enters through the inner lumen and is angled towards the tricuspid valve. In essence, VV ECMO requires the patient to be slightly stronger than VA. The reason for this is that venovenous ECMO maintains blood flow to the lungs and does not provide cardiac support for systemic circulation, while venoarterial ECMO completely bypasses pulmonary circulation and provides limited cardiac support. The patient also needs to have a high perfusion rate in order to be successful on VV, whereas VA does not require perfusion rates to be adequate. Managing pulmonary and cardiac systems requires ECMO and its associates to be maintained at specific settings. For example, the ventilators are generally set to hold a 20-30 percent fraction of inspired oxygen with breaths every three to six seconds. Specific to blood, the patient’s hemoglobin level must be strictly controlled and monitored and blood transfusions are readily given. Urine output and physical perfusion signs allow specialists to further evaluate intravascular volume status. The central nervous system is another focus and concern when a patient is on ECMO, primarily due to the risk of hypoxia and/or acidosis. Hypoxia, low levels of oxygen, and acidosis, the condition of low blood pH, both are dangerous conditions, especially in a patient with compromised health. The brain requires oxygen and neutral blood concentrations in order to function properly. It is not uncommon for the kidneys to struggle while on ECMO as well, due to capillary leaking and resulting edema. Therefore, diuretics are often given to help pull excess water off the vital organs and decrease swelling. ECMO is most commonly seen in pediatric patients with congenital diaphragmatic hernias, primary pulmonary hypertension of the newborn, and meconium aspiration syndrome. It can also be used as a bridge to cardiac transplant or low cardiac output following a surgical repair of a congenital heart defect. In pediatrics, there is no clear set of inclusive or exclusive standards that a patient must meet to indicate the use of ECMO. However, neonates have to meet certain criteria before they are placed on ECMO. The baby must have a gestational age greater than 34 weeks, a birth weight of over four pounds, reversible lung injury, and treatable cardiac defects. Although not as often used with adult patients, ECMO is still used as a last resort to provide acute support for cardiogenic shock or severe respiratory compromise. The standard medication summary for patients on ECMO generally includes an anticoagulant, antibiotics, a diuretic, paralytic, and H2 antagonists. Blood thinners like heparin are widely used as the preventative treatment for thrombosis, while H2 antagonists work against intestinal bleeding. Aminocaproic acid may also be used to minimize bleeding during cannula insertion. Common pain medications include fentanyl, midazolam, or morphine. Initially, medications like dopamine and epinephrine are given to work alongside the cardiac cycle. However, once the patient is stabilized on ECMO these medications can usually be decreased. Diuretics such as Lasix and Diuril target excess fluids in the body to prevent peripheral edema. Antibiotics are given at standard septicemic doses; however, maintenance doses vary. In addition to medications, patients on ECMO require frequent blood transfusions. While the recommended time on ECMO is three to ten days, it is known that the longer a patient is on ECMO, the more complications the patient is likely to experience. Ultimately the length of time a patient is on ECMO is determined by the patient’s differential diagnosis before initiating ECMO. Before discontinuing the circuit, the patient must slowly adjust to sustaining without the bypass and ventilator. During the weaning process, the ECMO flow is slowly decreased. If the blood oxygen levels maintain or improve despite a decrease in ECMO support and the patient is breathing above the ventilator, improvement is noted.